Some of the questions I get each week from our clients pertain to details of their individual projects. How do I do this or that, etc…? On the other hand, many of the questions focus on the small stuff within straw bale. How do I know if the bales in my area are any good? How do I find bales? How do I re-tie a bale or sew a wall? The answers to these questions are all relatively simple; however, they seem to recur enough to justify dedication of an article. 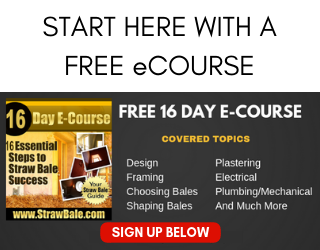 Finding bales may be one of the most important aspects of building with straw. If nothing else, it may well be the first important decision you make along the road to your new home. The most important things to look for when selecting bales are the color, the density, and the moisture content. I don’t bother much with the question about whether to use two or three string bales. In my climate, two string bales are more than enough to create a super-efficient wall system. To find bales, you can look in a local agricultural newspaper, visit a farm supply store, or contact farmers directly. Sometimes placing an ad in the paper can be successful too. When you approach a field or stack of straw, the first thing you should do is look at the color of the bales. The straw should be golden and not show signs of weathering. Any areas of dull brown or black straw indicate the bales, or even the pre baled straw, may have seen some weather and may not be suitable for building. Once you have convinced yourself that the color is right, you will want to randomly check the moisture content of the bales. The easiest way to do this is to use a bale meter and randomly select two or more dozen bales to check. Keep in mind that the farmer may be a source for a bale meter if you do not have one. In general, newly baled straw will be within the tolerance you need to build with because the farmer does not want moldy bales either. Do not exceed 20% moisture content. The density of the bales is very important, especially in load bearing structures. My local code calls for a Dry Density of 7.0 pounds per cubic foot. The key here is that we measure dry density. In other words, we have to remove the weight of the moisture within the bale that was determined in the last step. If we know the bales have a 10% moisture content and our bales weigh 45 pounds, then 10% of 45 equals 4.5 or 4 ½ pounds of water within the bale. Subtract 4.5 from 45 and we have the dry weight of the bale, 40.5 pounds. To calculate the dry density of the bale, divide the calculated dry weight of the bale by the volume of the bale. The volume of the bale is equal to the width x height x length in feet. For a bale 18″ x 14″ x 36″, the volume equals 5.25 cubic feet. So, 40.5 divided by 5.25 = 7.71 pounds/cubic foot. An easier, less scientific method is to lift the bale by the strings. There should be no more than about 5 inches of slack in the strings and the bales should not deform. Wasn’t that easier? 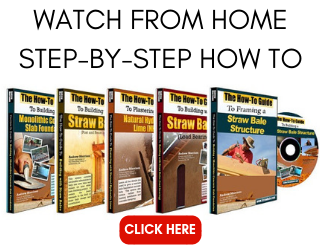 Some of the simple tasks within straw bale construction are the most important for a successful project. For example, knowing how to re-tie a bale may seem simple, but if your knots are not strong, your entire wall will sag under its own weight. I use a trucker’s hitch knot to fasten my ties. This knot is difficult to explain in writing, so I won’t even try. Check out knot books or our DVDs to see how to tie the knot. Be sure you put a lot of tension on your ties. If you pull too hard you will snap the twine. If that happens, you are on the right track, just pull a little less next time! I use the same knot for sewing my walls as well. The trucker’s hitch is one of the fastest and strong knots I know and is perfect for this use. Quality tools are a must as well. Simply baling needles fashioned from thin steel will work, but your hands will get sore and your time will be eaten up trying to use them efficiently. I use a sturdy handled bale needle with a specific nose design which allows me to thrust two separate twines through the bale at once. This and some other simple tools speed my re-tying process a lot. I also use what my wife calls a “bale rotisserie” to easily hold and spin my bales so I don’t have to keep lifting them to wrap and re-tie my twine. These two simple tools make my life much easier when it comes to working with bales. Again, these are the little things, but you do a lot of them over the course of an entire house! A little time saved in every re-tie is worth a few full days of rest by the end of the project. Something you will most definitely appreciate in the end. 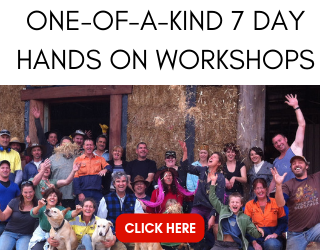 The small stuff in straw bale construction has a tendency to add up to a lot of time. If you plan ahead for the time you will spend, it will make your project timeline more manageable. If you expect to bale, lath and plaster all in a weekend, you are bound to end up upset and way behind schedule! Use the right materials, choose the right tools, take care of your self by drinking a lot of water and taking adequate breaks, and try to work in the shade when you can. This will all help to create a happy environment for you to build your dream and know that your dream will last over the years.